This is fourth lesson of WordPress tutorial for beginners. In this lesson we will discuss about Writing a new post. In previous lesson we discussed about Post, Pages , Categories and Tags and Dashboard menu option. In case you missed previous lesson read it below. 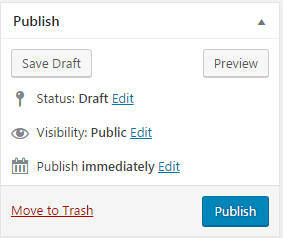 From WordPress Dashboard click on option Posts -> Add New. You will see part displayed in below Image. Not I have only shown left part of page. We will see right part of page displayed after discussing left part. Post title is title of your article. It should give idea about your post content. 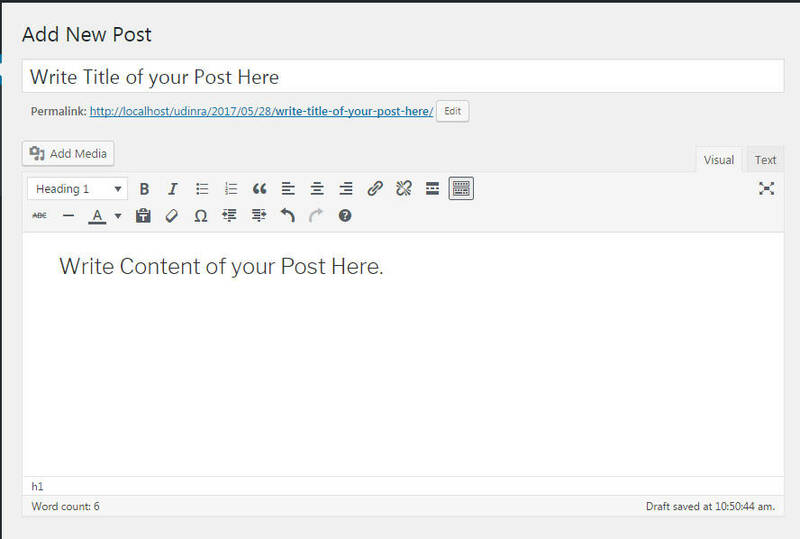 For example the title of this post is displayed in bold at the start (WordPress Tutorial for Beginners Lesson 4). Post title is also displayed in Google Search. Below image is Google search results page showing first lesson of this tutorial. The blue bold part is Title, below that is permalink and last part is description (meta description). 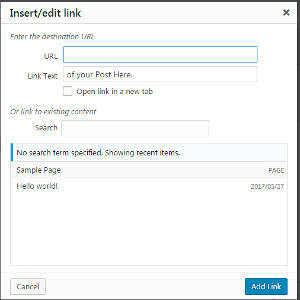 Permalink you can edit and set something which reflects post content. You should set it same as post title. You need to replace spaces with – and remove connector words like and or for. We will discuss more about Permalinks and importance of it in later lessons. Once you have set Post Title and Permalink it is now time to add post content. I have shown the place where you have to add post content in image. The place where you have to add post content is known as Visual Editor. You should have working knowledge of Visual Editor to write attractive posts. In this section I will discuss different icons you see in above image. If you noticed number of buttons shown in my Visual Editor is more than shown in yours. You can also see extended version of visual editor by clicking on Toolbar toogle button as shown below. I have given details of each button from left to right from top. I have used example text to denote the effect of each on text. The next three icons are for aligning text. The next two chain and broken chain icons are for links. I will show them later in this article. The sixth con from left is for displaying special characters in your post content. The last buttons displays keyword shortcuts to achieve functionalities of above icons. We discussed all the icons but left the first row first icon (with Heading1 in image). You can use it to display a text as heading or normal text. If you see this article uses many headings. Those heading are created using this icon. The heading are from Heading1 to Heading6. Each one has different size. The largest being Heading1 and smallest being Heading6. The paragraph is normal text you see in this article. You can paste URL of the page or site you want to link from your post content here. After pasting the link you can click on blue button. Also if you click on settings icon it will display below popup. Below popup window gives you more control. You can enter URL in the first box and the link text in second box. Click on the check box Open link in new tab. This will open the link in new tab. If this box is unchecked link is opened in same tab. You can search your existing post and link to it. I linked to lesson 3 at the start of this lesson using this method only. You can remove links by clicking on broken chain icon. That will remove links from your post content. Click on the Add Media button. It is below the permalink of the post. If you click on Add Media button below window will be displayed. URL – It is location of the file you uploaded. Title – It is title of the media. WordPress by default uses the file name here. Media File – Visitor will see image file in browser if they click on image. Custom URL – You can open any URL once visitor click on the image. 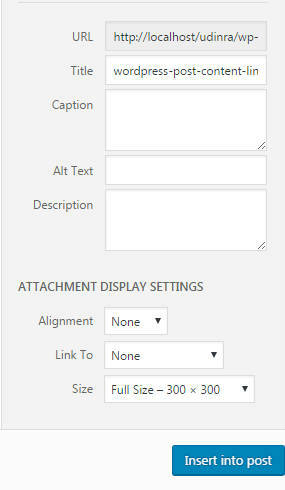 After making changes as per need you can click on Insert into Post. The media will be added into your post content. You can add as many media as you want in post content. Every article should be clubbed to appropriate category and tag. On the New Post page on right side you will see below two options. One is to set Category and Other is to set Tag. 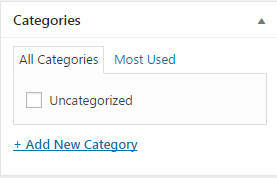 You can choose from existing Category or you can select new category. 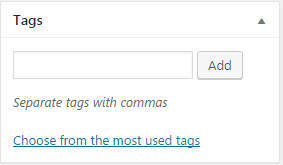 Similarly you can select from most used tag or you can create a new tag. For every post you can set featured Image. Whenever your post content is shared on social media this featured Image is also shared. Articles with featured images perform better in social shares. As along with post title a image relevant to post content is shown. The visual Image improves the traffic from social sites like Facebook. Click on Set Featured Image link. It will show window displayed when you click Add Media button. After that the process is same. You can select a image and set it as featured image of your article. Save draft button saves your post. It is good idea to save your post while editing. Preview shows how you post looks like. If you click preview button a new tab is opened which shows the content of post as it will be shown to visitors. The display also depends on theme you are using. We will discuss about themes later in this tutorial. You can set the status of post to draft or pending review. For example if you are finished writing article but want to get it reviewed by someone or self you can set the status to pending review. It will help you identify which articles are pending review and which are still work in progress. You can click on edit link next to it to set the Status. Private – Visitors will be unable to see the post. Public – Every one can see the post. This article you are reading is public. Note Public visibility post is only read by Search Engines. So until or unless you have some specific requirement you should set visibility to Public. You can click on edit link next to it to set the Visibility. You can schedule when post will be published. You can click on edit link next to it. After click you can set the time and date post will be published. 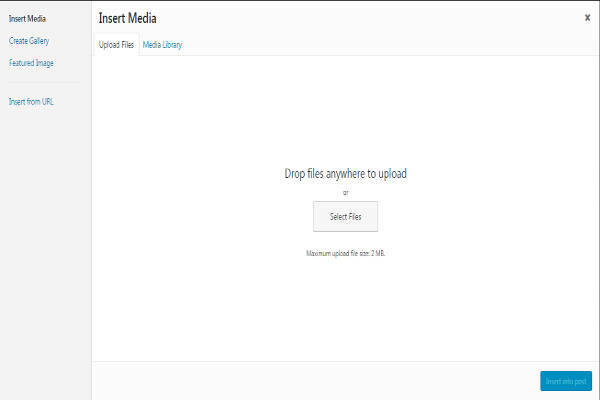 You can also publish it immediately which is default. After making above change click on Publish button to make the post live. Click on Move to trash link to delete the post. After publishing your post copy the permalink value. The whole link or URL displayed in permalink line. Open the link in a browser. You can see the page like visitors will see it. Also you can go to All Posts sub option under the Posts menu. You can see list of all posts. It will show Published post, Draft posts and other posts here. Note the post screen shot I used for this article is published and shown here. You can filter posts based on categories and tags here. Whatever we discussed here for posts is also applicable for Pages as well. In next lesson we will cover Settings menu of WordPress Dashboard.